IHS has ranked both ST Microelectronics and Bosch as number one supplier of MEMS devices. With both companies just shy of the $800 million mark, Bosch and STMicroelectronics each had MEMS revenue of approximately $793 million in 2012, according to IHS. The two companies do not use the same exchange rates every quarter when converting their revenue from euros to the U.S. dollar, and as a difference of less than 1 percent separates the revenue levels of both, IHS found it was not possible this time to declare a clear winner as to who was No. 1 for 2012. 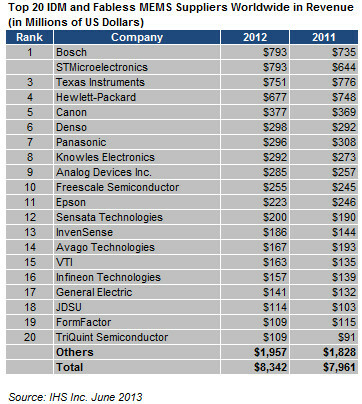 Overall, the top 20 MEMS manufacturers last year accounted for a whopping 77 percent of the industry total of some $8.3 billion, as shown in Table 1 below. The figure excludes foundry revenue in order to avoid double-counting of fabless and foundry takings within the same ranking. For instance, excluded is MEMS foundry revenue from STMicroelectronics for its fabrication of Hewlett-Packard inkjet print heads, or similar foundry revenue from Texas Instruments for Lexmark inkjet print heads. Foremost among all the players were the four companies at the top, each with revenue ranging from $675 million to $800 million, and collectively well ahead of the rest of the pack. Bosch, the No. 3 entity in 2011, enjoyed a MEMS revenue boost of 8 percent last year including a nearly 5 percent uptick in its primary automotive MEMS business, which accounted for 82 percent of overall Bosch MEMS takings. Bosch is unchallenged as the top automotive MEMS supplier with 27 percent share of the market. The company also has a growing consumer and mobile MEMS trade—up 17 percent for the year—thanks to the soaring sales of pressure sensors in handsets, compensating for slightly down revenues in accelerometers and microphones. But while the company did well in 2012, its result was impacted by an unfavorable exchange currency rate, especially in its U.S. automotive business. STMicroelectronics, the No. 4 player in 2011, counted on a robust consumer and mobile business as its main source of MEMS revenue. While rival Bosch dominates automotive, STM leads in consumer and mobile MEMS with 32 percent of the market. STM also made inroads into automotive with $15 million in 2012, up from $10 million the year earlier. Gyroscopes were ahead of accelerometers in contributing to STM’s cache, and similar to Bosch, pressure sensors for handsets boomed because of shipments into smartphones like the Samsung Galaxy S III. Falling out of the No. 1 spot was Texas Instruments, down to No. 3, with revenue down 3 percent to $751 million. While front projectors for business and education still formed the majority of its digital light processing (DLP) chip revenue, the segment was flat last year. In particular, DLP revenue in home theater and rear-projection TVs was down, especially with the exit of Mitsubishi as the last remaining rear-projection TV brand in North America. DLP revenue for pico-projectors also has not taken off as expected, with the chipset still too expensive and its adoption slow in the consumer and mobile markets. At the No. 4 spot was Hewlett-Packard with revenue of $677 million. HP also suffered a drop in ranking, down from No. 2 in 2011, as revenue associated with its inkjet printer heads contracted 10 percent last year. This follows a 15 percent decline in the shipment of inkjet printers. Moreover, HP’s revenue from the replacement of disposable print heads has been shrinking continually as the company long ago started to move to printers with permanent print heads. Rounding out the Top 5 but at a relatively far remove from the four other companies above it was Canon of Japan, with revenue of $377 million. In all, revenue for companies from the succeeding sixth spot all the way to No. 15 each had takings between $100 million to just under $300 million. Worth noting outside of the Top 5 was California-based InvenSense at No. 13, with revenue up 30 percent to $186 million. InvenSense is the most successful MEMS startup ever, its market breakthrough coming in 2009 thanks to its design in the Nintendo Wii Motion Plus gaming accessory. While InvenSense initially had been heavily dependent on gaming, the company wisely diversified its business and now looks to handsets and tablets as even more important sources of revenue. InvenSense has also pioneered serial production of 6-axis inertial measurement unit comprising accelerometers and gyroscopes in a 4 x 4-millimeter package. Combo sensors last year accounted for half of the company’s revenue, and InvenSense is now producing a very small 9-axis inertial measurement unit also containing a 3-axis magnetometer that measures only 3 x 3 millimeters.